Driving back from Great Ocean Road to Melbourne took a lot of patience. We had to concentrate as city driving has certain obstacles being from Saskatchewan wouldn’t be familiar with. 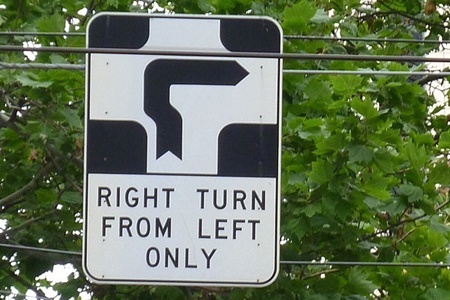 Example: Hook Turn – Because of the tram system in Melbourne, auto drivers must make a right turn by moving into the furthest left lane and driving forth. Always keeping in mind they must turn into the left lane. Sound complicated? Tell me about it. I’ve never been so happy to drop off a rental car in my life. Melbourne is a dangerous place to be for shoppers like myself. A girl could do some damage buying an entire store filled with shoes, clothes, jewelry and more. The weather here is much cooler and I can feel my tan begin to fade. As they move into their fall months, the temperature begins to drop. I need more sun quickly!!! Yesterday we flew to the beautiful city of Melbourne. 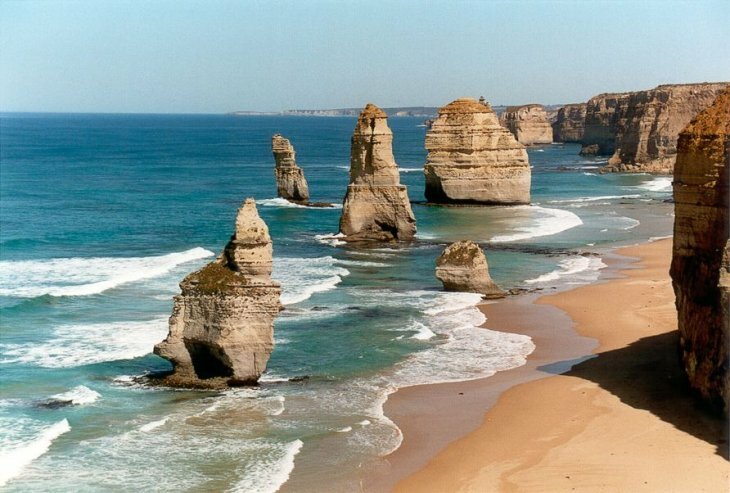 Here we will be staying with friends but today we drove the Great Ocean Road. Easily the most scenic drive of my life! 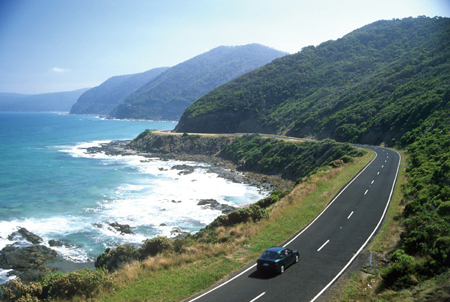 The roads are thrilling with gorgeous vistas around every corner. We rented a small vehicle for the day and I’m glad we opted for something smaller because those roads can be quite narrow. We made it from Torquay (beginning of the stretch) to The Twelve Apostles. The rock formations are stunning in person and I’m so glad we made it out there. Tonight we are staying at the Sandpiper Resort, a charming boutique style hotel located in Apollo Bay. After a long drive, we could use some R&R. We made the drive down south to Byron Bay today. This might be my favorite area so far! The small beach town is a happy mixture of tourists and locals. 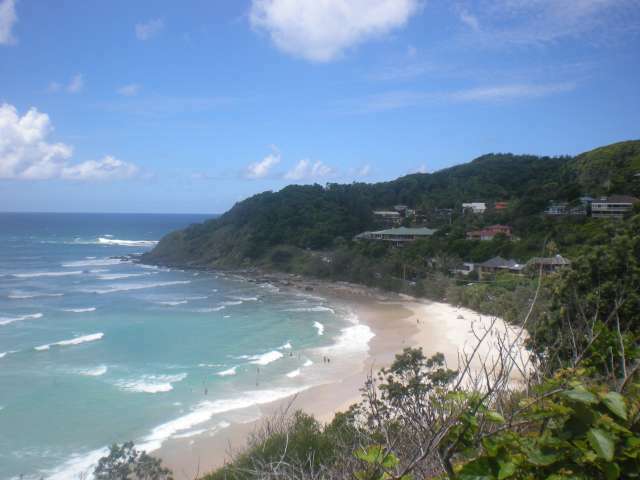 Byron is the most eastern point in Australia and seems to be a great getaway for nearby Aussies from Brisbane and other big centers. We spent the day walking around in the hot sun and discovering hidden beaches, excellent shopping and finally some affordable restaurants. The town area is not that big so it is very easy to get around. We met up with other Canadian friends who were traveling and hit the town for some cocktails and laughs. We were told that “The Balcony” was a great place to start the night with some Thai iced teas and kiwi martinis to compliment our delicious tapas. 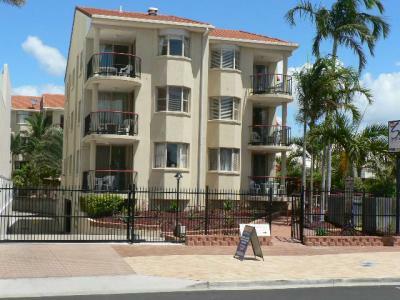 The Balcony is in a great location, right in the center of it all. Later that evening, we made our way to “The Cheeky Monkey”, a nightclub near our hotel. The music was loud, it smelt funny and it was filled with too many people. Just proves to me again that I’m too old for this. Sigh! 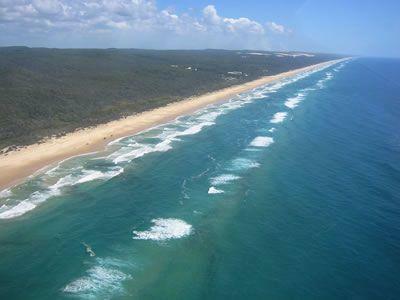 One of the great features of Hervey Bay is that you are just a ferry ride away from Fraser Island, the largest sand island in the world. We rented a 4×4 and cruised over by barge with our new ride for a day trip. Our day flew by with amazing, challenging trails and unbelievable sights. Driving on the beach with the water 20 feet away is something else. 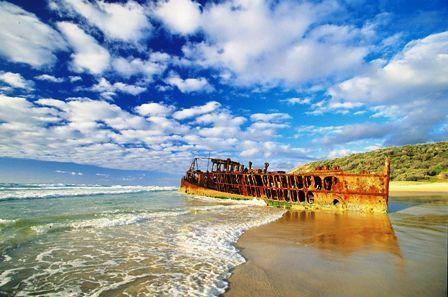 We also visited the beached shipwreck of the Maheno which has been on the east side of the island since 1935. The highlight for me was Lake Mackenzie, a large freshwater lake in the middle of the island. 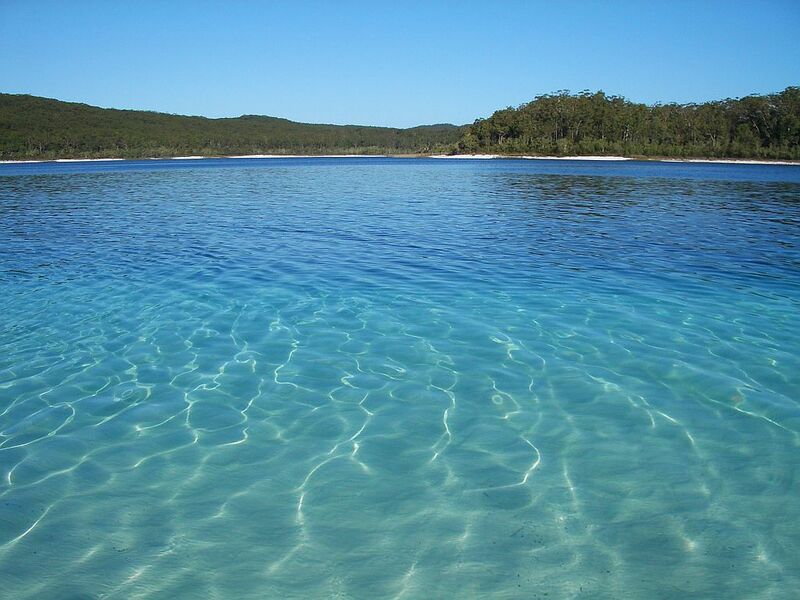 There, we swam in warm crystal clear water. It was so clean you could almost drink it. Looking for dingoes was a bust. Apparently, they aren’t the friendliest so maybe it’s for the best. Unfortunately, I threw my neck out and may need to be referred to a chiropractor from all the off-roading, I wouldn’t change a thing though. I woke up excited about our trip today to the Great Barrier Reef! It’s not every day you get to visit the world’s largest living organism. We had booked our excursion back home with Viator. We decided to combine our snorkel with a visit to Green Island, one of the many beautiful islands within Great Barrier. Our boat ride over there took about 45 minutes on what may have been the roughest seas my poor stomach has ever had to endure. Thank goodness for Gravol because I was able to keep my breakfast down! Arriving at the island, we quickly set up shop on the beach. We decided to take the Lycra suits that were highly recommended by the crew. Jellyfish stings are on the rise at this time of year so it never hurts to be careful. We jumped into the warm water to find the best snorkelling we’ve ever experienced! The pockets of coral, fish and colors are indescribable. I can’t believe the amazing things we saw. 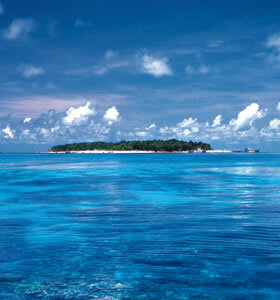 Green Island is a haven for those looking for some peace and quiet. There is a small resort here for people who want to spend a few days. We packed a picnic lunch as prices on food are quite high. I think food prices here are even higher than in Europe. All in all, another great day! Today we flew to Cairns in Northern Australia. This is my first time using Jetstar Airlines. I was worried about the overall experience because their fares are so cheap, but I was pleasantly surprised. We rented a car and had a day exploring the northern coast. Cairns and the surrounding areas are very humid and it feels like we are in a tropical jungle. Everything is so lush and green. We first visited Ellis Beach where we had the area to ourselves. You couldn’t see another person in sight for miles of shoreline. The UV rays are very high so we have to be careful about burning. It’s such an intense heat here. Next, we did some cable wake boarding using a cable line. None of us had seen that before. The boys are awfully sore but for $39 AUD each they are happy they tried it. Next, we made it to an animal sanctuary in Port Douglas, just 50 km away from Cairns. There we got to feed kangaroos! It was amazing. I was very nervous at first because it’s a big open area with about 50 kangaroos and tons of birds. It took me a while to get comfortable but what a truly Australian experience! After a long journey, I’ve finally made it “down unda”. I am so glad we went direct from Vancouver because the flight was painfully long. We quickly hopped in a cab and started our trip to the busy, yet beautiful, Bondi Beach. It almost reminds me of Waikiki beach with all the shopping, restaurants and bars. It is very commercialized but appeals to the young with plenty of hipsters and surfers looking to relax. We stayed just across the street at Hotel Bondi; a grungy little hotel with what might possibly be the best location on Bondi Beach. 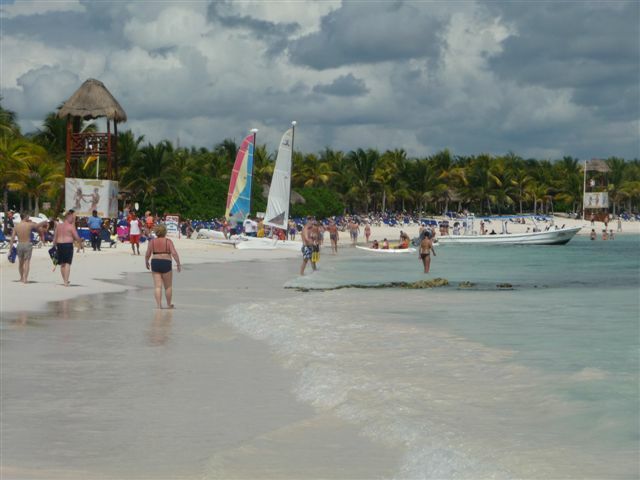 The beach is powdery white sand and there is plenty of room for the thousands of people who spend their Saturday’s lazing around. It is so beautiful here and I’m excited to come back at the end of the trip to explore the rest of Sydney. Some cousins and I caught a cab into town and went shopping on Tuesday afternoon. We visited the market on the island, a tequila store (go see Jose Ibarra for the best deals and a no pressure experience), and of course Hermanos for some shoes! I got some cute flats for 99 pesos, you can’t get a deal like that anywhere in Canada! We had a great time shopping downtown and most of us went more than once. There was never a moment where we felt unsafe, I felt a lot more safe than I do in Saskatoon actually. Except maybe while crossing the street… that’s a bit scary! Since the sun came out we had a great rest of our week enjoying more boogie boarding, kayaking (I have the bumps and bruises to prove that one), water aerobics, dance lessons by the pool, and ping pong tournaments. A few of us went on the Mariates Eco Discovery with Vallarta Adventures on Wednesday. We had a great time on the boat learning about the different birds, whales and dolphins in the area then went snorkeling. After the educational part it became a bit of a party boat and the crew even acted out Grease. Overall this excursion was a blast. On our last night our entire group decided to check out the “Last Saskatchewan Pirate” which was a tour we purchased through our Transat rep. My immediate family had actually done this tour last year but we talked about it so much the rest of the family thought we should check it out. We had an absolute blast. The food on the ship is amazing (I recommend the steak) and the entertainment is so much fun. Maybe it’s because they make sure you never have an empty cup, but every member of our group loved this night. Our personal pirate Julio was exceptional. He had a larger group of guests than any of the other pirates but yet we never seemed to need a thing. He was always there to make sure we had our drinks and meals. I highly recommend this tour to anyone visiting Puerto Vallarta (if you’re not from Canada, you may want to consider a night other than the “Canadian” nights.). It was awesome to be able to go out as a group and just enjoy each other as well. Since we were such a big group we didn’t necessarily get to see everyone throughout the week, different people have different interests. It’s a nice way to have our quality time I guess. Our last day at Dreams was good. We had to check out by noon and our transfer wasn’t picking us up until around 10:30 so it was a bit of a long day with no rooms to go to but we made the best of it. For the most part we hung out by the pool. The hotel had their Mexican Fiesta that night which was wonderful. I asked one of the entertainment staff members to get us a table for 18 and he hooked us up with two tables for 10. A mariachi band played and some dancers preformed. A man and his son came to the resort and made balloon hats for everyone there. It was a really silly way for us to end our vacation with a lot of laughs and some squeaky colourful hats. Hola from Dreams Puerto Vallarta! My extended family has discovered the awesomeness of traveling as a group. This is our second big family vacation and from the sounds of it, it will not be our last. The amazing thing about traveling with 17 other people that you know and love is that there is always someone doing something that you want to do, you want to go into town and go shopping, there’s someone doing that, you want to go on an excursion, there’s someone doing that too, you want to sit by the pool, of course someone else will be there to talk to! There are always people ready to play the “crazy games” by the pool or up for playing football on the beach. It’s great to spend quality time with people you might not see regularly and just remember who you all are. I highly recommend doing this with your family or friends! Dreams is a great resort of this type of trip. It’s small enough that you can always find someone but also big enough that it does not feel crowded. There are tons of activities to keep us busy (we’ve been doing a lot of boogie boarding and some people have some serious battle scars to prove it). We’re close enough to town that it’s only a five dollar cab ride in (or seven pesos bus ride!) if you want to go shopping or clubbing. The food so far has been excellent. The day time entertainment is always great; they are constantly looking for people who want to play volleyball, water aerobics, do crafts, cocktail lessons, whatever. The nightly entertainment can be hit and miss but for our group this isn’t a problem. We entertain ourselves. Last night was Casino night which seemed to be a hit with a lot of the family. Tonight is Mardi Gras so that should be a lot of fun. Yesterday 10 members of the group went on the Outdoor Adventure excursion with Vallarta Adventures. They were gone for about six hours and they came back PUMPED. It’s an awesome excursion including a speed boat, a donkey ride, zip lining and rappelling. They said there were some spots where they would just free fall for about 20 feet. Apparently my one cousin is a legend after that drop. They saw a lot of beautiful landscape and came back with tons of stories. They even ventured out of their comfort zones and took a city bus back to the hotel instead of a cab. Meanwhile some of us just chilled by the pool enjoying the 2 hours of solid sunshine we were blessed with. The weather has been a bit odd for Puerto Vallarta. It’s cooler than it typically is and it has been quite cloudy. We don’t mind, so far there are no sunburns to report which is a pretty big deal for our pasty clan. Tomorrow some of us will go on a snorkeling excursion and hopefully see some whales too. Another family that is traveling with us is going to do some deep sea fishing today. I heard that they may be able to get the seafood restaurant here to cook whatever they catch! Alright I’m off to breakfast and then shopping in the city! Hola from the Grand Palladium on the Mayan! We left Saskatoon on Friday with Transat, arriving to the airport at 4:15am and the lineup was really long. Thank goodness that we had purchased Option Plus so we had our own check in and were through in no time. Security was quick so we were at the gate by 4:45 – not bad. With Option Plus we also got to board first, received a bottle of champagne, a travel kit with fleece blanket and first choice of meals – a great way to start a holiday. We arrived a little late into Cancun and that’s where the fun began. We spent probably two hours in line to go through immigration. They were not ready for that many people, but finally we were through. We found our Transat Rep and made our way to the bus. The ride to our hotel was about 1 ½ hours but we had beer on the bus so all was good. Because it took so long to go through immigration and customs we did not hit the resort until around 4:00pm. It had been a long day so we went out to supper at Ribs and More and then off to bed. The food at this restaurant was really good. We got up on Saturday to clouds and rain. Off to breakfast and then we had our meeting with our Transat Rep. It was very informative and I would recommend everyone to go as you will learn a lot. Are you confused about what money to bring? I am too, so I took it all! I had USD and Pesos, debit card and credit cards. At the airport we tipped in USD and bought beer in USD no problem. At the resort, prices are in Pesos but you can also use your credit card, so I think that you are good either way. There are two ATM’s in the lobby. One dispenses Pesos and the other American dollars. Our rep went over the tours and prices. The resort is great but very extensive. It will take us a couple of days to find our way around. Although it was cloudy out, we went to the pool and stayed out there until it rained. We went for supper to the Rodizio, a Brazilian restaurant and it was great! Unfortunately, the show was not so great so we went back to our room to get our laptop as WiFi is free in the lobby. We sent a few emails and in the lobby there was a great band so we stayed for a while. The Colonial is by far the liveliest of the lobbies. Today we awoke to sunshine. We met up with the wedding party at breakfast and sorted out some details. Then off to the beach, the beach here is very long and there is never any problem getting a chair. There are two beach bars for drinks and snacks. This afternoon we walked around the resort to the Spa. It is very beautiful and you can look down the center of the spa right out to the infinity pool. 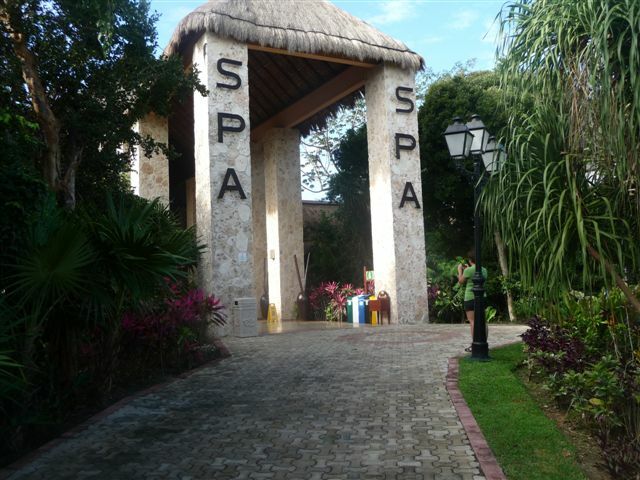 There is no one less than 18 years of age allowed at the Spa, the spa is a combination spa and gym. They have a lot of equipment with a separate aerobics studio. The sauna, hot tubs and pool are free to guests. We will go back as the pool area here, it is nice and the ultimate adult’s area. From here, we went around the corner to the sports area. If you or your kids are into any sports, this is the area for you. They have mini golf, two soccer pitches, two basketball courts, volleyball, and tennis courts. All the equipment can be signed for at the sports hut. After having a look around the sports area we went back to our room to get ready for supper. We went to the Italian restaurant, The Portofino. The food here was really good. We watched the rest of the Super Bowl in the theatre, they had three big screens for everyone. It was loud but everyone was having a good time. When we got up this morning, it was pretty cloudy – perfect time to go check out the kids clubs. If you have kids, this is a fantastic area. The have The Racoons Club divided into three age groups; babies, 4 to 8 years and 9 to 12 years old. They have their own building with their own schedule of events. The kids that we saw looked to be having a great time. They also have a Junior Club called Black & White for teens. They had special dinner’s together, music lessons, beach volleyball, basketball tournaments, really something for everyone. I think your kids will love it. For those of us that are older but young at heart, they have great animated employees that keep things going around the main pool. They have other activities like bartending classes, cooking classes, and Spanish lessons just to name a few. It would be impossible to be bored here. We are going to the buffet in the Colonial tonight to find out the final details for the wedding. The wedding is tomorrow at 4:30pm so we hope the rain holds off! It’s wedding day! The day started off with great weather so we took a walk to see the spa. It is really great with the spa side and the gym side. There is also an infinity pool her for adults only right in the middle. It was really quiet out here, the perfect place to get away from it all. The gym was quite large with newer equipment and they also had an aerobics room where they hold classes every day at 5:00 pm. The wedding was at 4:00 pm which was a great time; the weather had cooled down and it was perfect for the wedding. 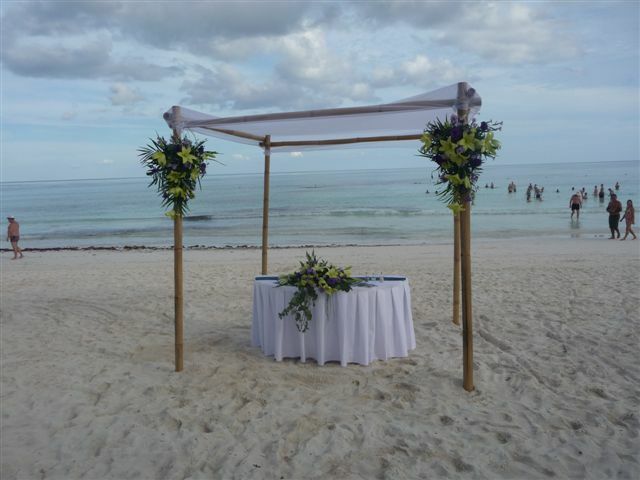 The wedding was held right on the beach under a gazebo and the flowers were just beautiful. The bride’s family had brought some of the decorations from home which the wedding coordinator used on the chairs and they used star fish as pew markers. It was probably one of the best locations on the resort to get married. It was great sitting in your chair in bare feet with your toes in the sand. The wedding coordinator went out of her way to make sure that everything was perfect, even clearing the beach of other hotel guests so they wouldn’t end up in the pictures. The celebrant who did the wedding ceremony was perfect. The wedding ceremony was about 15 minutes long and then we all had a glass of champagne – a great way to end. Supper was on a secluded patio which the staff had decorated. Right from the welcome cocktail to the desert we had top notch service. This was by far the best meal that we had at this resort. This was truly a dream wedding. Grand Palladium Resort. Our room was a junior suite and very spacious. It was very clean with great maid service. With a resort this size, there are so many choices or pools, restaurants, shows and things to do. They had eight a la carte restaurants so getting in to eat was never a problem. I would say the only down side would be the distances to walk if you had mobility issues and I would say the food was good but not great. The staff more than made up for that. They were always friendly and willing to help. Thanks to the Grand Palladium for making this a great trip.